DK wasn't happy. He moved to Seattle, took a new job, settled in and looked around for a social life. He didn't find what he thought he'd find. He tried the neighborhood hangout, he tried his work buddies. He even tried church, but he couldn't seem to settle in anywhere socially. And, the women were shallow too. Even though he said he had a good job, DK said the women he dated were more interested in whether a fellow brought home a good paycheck. His problem, he concluded, was the city. "Seattle is a cold city," he wrote. In other parts of the country, it was different. (In other non-Seattle cities) (t)he people's spirits... seem to go out to one another in friendship. They are interested in others interested in doing things together. They feel that a stranger has something to offer in their social life and they give him the opportunity to do so. Conversly in Seattle, most people live in a house and their spirite of friendship fails to go beyond the boudnary of their own home or intimate circles of friendship. The viewppoint of the average person in Seattle is "My home and friends are the world -- beyond them there is no worth -- beyond Seattle, there is no world." This Seattle is Unfriendly theme (or Seattle Freeze) isn't very rare. You hear it from time to time as people get acclimated to the area. But, it is amazing how far back this complaint goes. DK was a World War II veteran writing to the Seattle Times after settling in Seattle after his service in the Navy Reserve. While more recent complaints have blamed technology for the phenomena, DK probably didn't have to fight a smart phone to make friends. The overall cause is probably something a bit more ancient, so blame the Nords or the climate. Either way, you can track the Seattle Freeze consistently through the decades. Rick Anderson wrote in the Times in 1979: "Seattle is no -- NOT -- a friendly city." Fred Moody, writing in "Seattle and the Demons of Ambition." specifically cites the Seattle Freeze as one of the reasons people moved to Seattle in the 1980s (or, more traditionally, had a hard time fitting in). The two terms you heard over and over again when newcomers rhapsodized about their new Seattle home was "laid back" and "nice,"the clear implication being that, outside the Northwest, people where "agressive" and "mean." Again and again I heard transplants describe the same rite of Northwest passage. In talking about how hard it was to make friends when they moved to Seattle, then invariably described an episode in which, after a few akward months here, they were taken aside by a kindhearted, more Seattle-savy acquaintance at work or in their neighborhood, and told that hey had to "tone it down," "dial back," or "turn down the agression" in order to survive socially. But, this flip side of the Freeze, the non-Seattle Crazy is just as important as the Freeze. Because, if you're insane, maybe it really isn't us. Maybe its you. I most certainly do not agree with DK when he speaks of Seattle's unfriendly attitude toward outsiders. Since the first day I arrived in Seattle a year ago, I have been treated with the greatest courtesy and kindness. I would like to know what DK wants. Maybe he needs a few lessons in "correct approach" when he comes to a new city. In fact, published complaints about the Freeze seem to correlate with new people coming in. Take a look at our migration rates for Central Puget Sound (Population Change and Migration, Puget Sound Regional Council), there are three peaks since the Boeing bust: the late 70s, early to mid 90s and post 2005. It might be cherry picking, but Anderson wrote about Seattle being unfriendly in 1979, here's one piece from 1994 and the original Seattle Freeze article from 2005. The Seattle Freeze might be our social disease, but it's a condition that only seems to appear when we mix with new folks. So, why is that? Maybe, in fact, we're sane and you're all crazy. In fact, maybe you come here, act all neurotic (a tendency to experience unpleasant emotions easily, such as anger, anxiety, depression, or vulnerability; sometimes called emotional instability) and expect us to be able to deal with that. Here's a study that back up what my point in (via here). 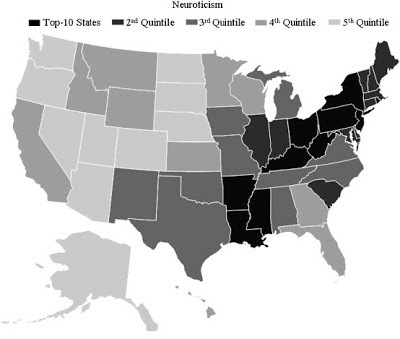 The darker the color on the map, the more easily the resident of your state experience unpleasant emotions easily. The lighter states, the more relaxed people are. The same study pointed out that the typical Northwesterner was very open, but also very introverted. So, take that with the very sane label, I could see why crazy extroverts from other parts of the country would have trouble here. The idea that Seattleites are nice just because they don't have the balls to be assertive is nonsense. Seattleites aren't nice, they are reserved and suspicious. Suspicion is not conducive to harmony. That is a cultural problem that will hopefully right itself now that people are becoming aware of the "Seattle Freeze", and as out-of-towners slowly take over the NW area. Oh, and dealing with the rest of the country's neuroticism is a burden? It's called empathy; another term Seattle folks should become acquainted with. I actually know a lot less about Seattle people specifically, I was pushing beyond that particular city. That said, think it is a matter of point of view. What you might suspect as being suspicious might actually just be reserved. And, the point of the post was that the Seattle freeze has nearly always been around and recognized. So, I doubt the slow migration of new folks will have any impact. I agree with what the anonymous poster has written. I moved to the Seattle area about a year and 1/2 ago. -I learned quickly that my "southern" accent caused Seattleites to automatically deduct IQ points from me in their heads. -I also learned to "tone down" my passionate extroverted personality. How dare I be too aggressive or proactive? -Seattleites pride themselves on the said "cascadia calm" or "native Seattle". They should be cognizant that their behavior translates to RUDE in every other region of the country. -I would always introduce myself and be NICE. -I would always give people a chance, and get to know them. -I would try to make people feel comfortable and welcome, regardless if it were a work situation or social. I'm a very helpful and giving person, it's how most true southerners are raised to be. I'm a connector of people, too. I genuinely want to help if I possibly can. You know what this really is about? It's called MANNERS. It should be taught during childhood and practiced throughout life. I don't care if you're of Norse decent, an introvert or whatever your excuse is. So Seattle, it's time to be nice, polite and have some manners. I have to agree with Anonymous and Kim, Emmett. There's nothing wrong with being more introverted, as long as you don't demand and are rude to other people who are not. Most people in the world are much more extroverted than the Pacific Northwest. It's not insanity. People look at Pacific Northwesterners as being over-sensitive. When somebody is being more outgoing or assertive, they arn't being "mean." But "mean" is the default assumption Seattleites, and Pacific Northwesterners have about that. Being indoors all the time because of the weather may give the locals this kindof "indoor manners" for all of their interactions, even when thry are out and about. But what you have to realize, is most people in the world live in a place with better weather, and so are used to being more outgoing and interacting with people outside of their home and social groups. We learn at a young age (usually about juniorhigh-highschool and definitely by college) that we have to get comfortable meeting people outside our social groups, and the kindof clickish behavior that Seattleites find normal, elswhere is consider "highschool or middleschool behavior." The implication, being kindof shallow and juvenile. B) Sort of demand/expect/insist that people who move here adopt local ways of doing things. People arn't going to do that. They have a right to be themselves, and if you want to get to know them (and also not be rude, and rather polite) PNW'ers actually have to step out of their shell a little bit and show a little less fearfulness. Have courage! People arn't as mean as Seattleites think they are, after all, people all over the world have friends. It's ok to actually be sincere with people and have depth, and intense friendships, and sincerity. To have real loyalty, and not backstabedness. You can't ask people to tone it down. You're asking them to not be who they really are (most of the world) and that's rude. It's like asking them to "tone down" the fact that they are gay or the fact that they are Buddhist, or black, or whatever. It's just the way people are. You can't ask people to pretend to be something they arn't just for you, and then act all hostile and like they are being rude for just having a higher energy level than you, or a stronger personality. They're not being mean, it's just like asking a taller person not to be tall, and to stoop down on one knee so you don't have to look up when you talk to them. You can't do it, it doesnt really work. To use that analogy, you just have to accept the fact that you are shorter and they taller. And love and accept and have compassion for each other anyway. @Sara, I wrote this post (and subsequent posts) from a position of defensiveness, trying to defend the regional personality from criticism. I suppose this is a debate about what constitutes normal behavior. Kim's reference to "It's called MANNERS" was particularly interesting. Because where you are matters in terms of what manners are. In the South, manners are introducing yourself and expecting a lot of back and forth. Up here, that's considered rude. Like Kim's in the position of defending Southern Charm, I'm here defending Cascadia Calm. I appreciate what you are doing Emmett, but the thing is you are acting like there isn't a larger truth. You are saying things from the perspective of saying "well, we like it this way here, so that's what we want." And you know, it's fine to want that, it's just you can't expect it to stay that way. A lot of people in the PNW area are very sensitive. And you know, it's fine to be sensitive, it really is. But you can't expect other people to kind of bring themselves down to that level just because locals here find a higher energy level abrasive. It's like asking someone not to be tall, to use the previous example. You know, if you're a short person (so to speak), that's ok, but you can't ask people who move here to pretend that they are not the "size" that they are. This area has been a kindof monoculture for a while, where many sensitive people lived here, and other sensitive people from other parts of the country moved here because they liked being around other sensitive people who understood them, and knew what it was like to be sensitive. And that's fine, there's nothing wrong with that. But the thing is, there's too many people in the world now. We've hit 7 Billion people and are on track to 9 and 10 Billion. There's not enough space for all the sensitive people to have their own space and not have to interact with people who have larger energies than them. It's not a personal thing, and people aren't trying to be mean, they just are who they are. They can't help the size of energy they have, and that they are kind of a "big fish." Nobody means to harm the locals, or scare them with their larger sounding ways, but it's just who they are, and they can't help it by means of their sheer size of their energy. In other parts of the country, where there is more "sensitivity diversity" for lack of a better term, people just learn from a young age to navigate the waters so to speak with many different "size" people. In here, in the PNW, people have just gotten used to the same size people by and large, and what you refer to as having "calm" waters. But you know, what is "calm" to someone or not, varies depending on the size of their energy level and how sensitive they are. Some fish whitewater rapids just fine. I'm very sorry that the waters are becoming more stirred, but it's just going to happen. There's no helping that. It's not the out-of-state-ers fault, it's just the fact that people are becoming more populated and the earth smaller for it. I feel for you, I really do, but there's no animosity involved, it's just human population growth. It sounds like the commenter Sara is saying the regional culture of Cascadia shouldn't be approached with the "when in Rome" attitude that other regional cultures are afforded. Even moving from the mountain states I noticed a distinct cultural shift. I made the adjustments needed to fit in and got on just fine. I assume that if I ever move to Atlanta or London or Prague, I will discover I have to make adjustments in my behavior to fit in as socially acceptable, normal . I really don't understand why the Cascadia Calm / Seattle Freeze thing gets such a bad rap. But saying that the cultural norms and expectations of the whole region are wrong, and its people need to behave like people from other regions is pretty imperial sounding. the prevailing customs, ways of living, and habits of a people, class, period, etc. ; mores. ways of behaving with reference to polite standards; social comportment. There is no "larger truth" about manners. They are social contracts in a state of constant negotiation. Kim, I can already tell why you have a hard time in Seattle - you obviously have very strong ideas about how other people aught to act. Congratulations. Seattle has two main personality strains - the Scandinavian kindness and reservation combined with American western/frontier live and let live liberty. Neither of those are conducive to telling others how to act or burdening others with your issues. It's not a place for braggarts who talk "I I I" all they time. I haven't had a hard time in Seattle. I'm actually doing quite well!! But thanks for your concern, "anonymous" :) and regarding speaking from an "I" approach: should I speak for all transplants here? No. I challenge you to meet some new people where you work, live that have moved here in the past months to about 3-5 years. Ask them how their experience has been. I'm glad to see the involvement of growing the social/emotional side of a child along with the academic. I think we're talking past each other here a bit. What I think I'm trying to say that along the spectrum of rude behavior, there are things that are considered okay to do in the south, but are rude up here. I wouldn't say that " introducing yourself after some chit chat/you click on some common interest" is rude. On the contrary, I like it when people do that. I must say, the social climate is a bit frigid particularly in Seattle. I do have a slight Texan accent, am fairly friendly, and don't expect a bunch of back and forth banter. However, I can feel the freeze when the 'native' can't wait to retrieve the hand they've reluctantly extended in greetings, greetings for the most part initiated by me. I can only comment on this reality as a person who is well traveled, having lived in nearly 60 cities, worked for the military, and experienced as a customer service professional. It almost feels unnatural, with an aire of 'better than', as opposed to meeting on even ground as two empathetic, caring people. Well, because I think the attitude of indifference really means "I just don't give a f**k who you are". Not that other regions don't have their ego's or cliques, I've just noticed a lot more freeze attitude in this region than ANY other. Two examples from just today alone: Got my hair cut and asked the lady if she knows where the closest bank is, she replied "If you have a phone you can google it". Oh, and the guy I noticed happily chatting up some likewise natives, without being obtrusive I cordially introduced myself and told him I liked his take on a certain idea he brought to the public forum earlier. His cold and indifferent reply as he struggled to put his hand out for a half-hearted shake ..."Good, see ya"...then literally brushed past me, that smile he had earlier nowhere to be found. I really was taken aback by the end of this day. And the list of freezes I can't recall anymore. It may be geneological, from the bloodline, or in the damn water, idk. But it is absolutely present. Y'all need to get some Seasonal Affective Disorder (SAD) bulbs and lighten up! Catch more bees with honey than vinegar, and if the freezers don't like honey, they can live a bitter honeyless life. It doesn't have much of an affect on me as I do find a good amount of genuine folk here that I can live with...most of them( not all) originating outside of Seattle. The saying you can catch more bees with honey than with vinegar is very true. Judging people is acidic like vinegar is. Smiling to people and being kind is great honey. That is bare bones advice on how to go about interacting with others. I live Seattle, my neighbors in my community, the people at stores I frequent because they are local and sell local items. The environment, the culture resonates with me. It's a big part of who ai am. You don't try to make others fit into your own personal world so that you can mesh better with them. That is a type of using that doesn't work. People can have off days. We all do. If you meet some people you believed to have this lovely term "the freeze"they are not trying to freeze you out. They don't know you. They may hear your accent and be reserved because your accent clues them in that you may be one of thousands of people who come and go. Many people move here and it's not a good fit for them. That is not something negative, but just fact. They may be reserved because they are used to outsiders moving in, and criticizing their home, the people they love, and the weather. If someone tells you to Google where a bank is, it very well may be that they don't at that moment know themselves and came up with a solution for you that they would do, like googling it. What you put out into the world returns to you. If you are looking for examples of how this "freeze" thing is prevalent, then it prevents you from seeking out all the examples of kindness, people smiling, laughing, helping each other. Every day I encounter people who are very positive , open and friendly. If I run across someone who isn't, I don't take it personally. People are allowed to be who they are. There is nothing you can do to change it. Leave it be. You don't move in with room mates and expect that they will be thrilled if criticize how they have their furniture, the way they dress, talk, their own personal beliefs and traditions. That would be rude to expect that. No one should have to change just for you because you don't understand. That doesn't mean your way of interaction is wrong. It doesn't mean the way Seattle people interact is either. You have a choice here. If you fel like Seattle is a good fit, ad you want it to be home for you, then stop trying to change others so you can feel more comfortable. If you don't think it's a good fit, then you should move, because it doesn't make your life happy. One thing that will make it a constant point of stress for everyone is living here and actively seeking out examples of how the people I Seattle are just wrong in the manner that they live. Nobody n any region would appreciate that. If you moved to say Appalchia area would you expect the people in that region to change their rich culture, or their attitudes just for you? Every region has their own culture, their own history, their own behaviorisms. If you don't understand it yet, at least don't put down the people where you live because they don't think and act as you want them to. Don't try to change them it's not your designated mission in life to do so. If you thnk After moving here give it time, and try to take out your pre- conceived judgements so you can see clearly that the Pacific Northwest has it's own rich culture. This is our home. What's the nickname for the phenomenon of people moving here and complaining because it's not like where they used to live? Passive/Aggressive attacks with an "anonymous" user name. Sounds about right. What I've come to realize since I posted on here back in August 2013, there are super cool awesome Seattle natives here. You just have to ignore the one's that freeze and find the cool ones :) They're out there! Even my Seattle native friends talk about the "freeze" and they tell me "yes, there are more of people like us here-I promise!". How refreshing and true. Fascinating and defensive dialogue here. I'm originally from Wisconsin, but have lived in the South for 10 years, New York area for 3, SF Bay Area for 2 and experienced 3 years in Florida as well. I've been surrounded by southern hospitality for the past 10 years. When I leave the area (Asheville) it is noticeably different in terms of how people relate. I must say that small town folk are generally more chatty anywhere in the country. In the larger cities, there are definitely some distinct differences all around. I recently visited Seattle and loved it (of course). I am actually somewhat of a loner and was rather amused and comfortable with the fact that half the folks commuting by bus had their headphones on. Same thing on the NY subway. It's not a small town and you shouldn't expect people, after being surrounded by endless other people all day, to reach out and start talking to you. Contrary to what you think, Atlanta isn't exactly embracing, either. I live 3 hours from there, and yes, it is friendly for a big city. But we need to realize that simply by virtue of population and pace, it is a different animal making friends in the metropolis. I certainly noticed that in Seattle, people aren't rude, but they are more soft spoken. In fact, it was painfully obvious. Why this is, I cannot say for sure. The most talkative folks I met were from other countries. But I did meet some very nice locals too. I can agree, in my limited experience, that they don't exude the neurotic personality that one sometimes finds in the cramped east. But in the east's defense, I have had wonderful experiences in NYC, easily made friends there, and all around a very genuine experience. Perhaps it is simply the pace and the confined space that leads to a more neurotic disposition. Culturally, it is a boisterous lot too. I'm Polish descent and my family settled in Chicago and now northern Wisconsin, and I find that midwest people probably have more in common with PNW folks than the east coast peeps. But I don't find the midwest to be passive aggressive in the way that I discovered California to be. That was difficult. I feel there is some truth to all these stereotypes, but we can't help but exaggerate them because we are always pulling from limited experience. The point is, people are different everywhere, and while we see some commonalities and personality traits of certain communities, in the big city, you WILL meet all types. In all the big cities. Seattle is a beautiful place and while reserved, is also graceful and chill and I don't know why anyone would say there were no "manners" there. I never encountered any rudeness. The rudeness lies in the level of narcissism you have, in expected people to reflect you back in only the way you need and desire, without a thought as to what you might be reflecting/projecting onto them. I've made friends much more readily in other parts of the country, including "The Hill" (That's The Capitol Hill where all the senators live) and I have to say, Seattlites seem very strange. I came here for a job, lost it after six months (which has never happened to me, especially after six months of praise from my manager). The people at work were either supremely stupid or supremely arrogant. I can't decide which. I was placed through a placement agency. The woman I reported to was snarky and broke a lot of privacy and HIPAA laws. I'm no dunce..I'm considered to be at the top of my profession, but D.C. was more welcoming (especially at work) than Seattle. Seattle is a great city to live in, it's clean and pretty, but I will probably end up leaving for a job where I grew up, in Southern California. I will never catch on to the culture here. The people seem either very robotic or very toxic (as at work). They criticized me constantly and point blank just refused to work with me. They were extremely cliquish. If I were to be given a do-over, I would never have come here. I will never grasp "Seattle speak," where a yes means no, and who knows what a no means. I did have one neighbor ask me if I wanted to come to dinner, then when I followed up to provide her with a date, she never responded. When I first moved to D.C., I was welcome on every venue. A coworker, who barely knew me, really extended herself to me, inviting me over for Christmas. What's up with all the cliquishness? I hate Cascadian Calm. You can't tell what people are thinking at all. That's right. NEVER apologize for who are or conform to others' misguided expectations. Your opinion is valid and has merits because others feel the same but may not have the courage to express their feelings. Hi five! Conformity is the way of life up here in Seattle and it's a love it or leave it affair as your post clearly demonstrates. Get over yourself and accept the fact your perpective is the only truth. After receiving feedback from folks from various regions of this large country hopefully you have learned something. And good fences make good neighbors so long as you keep on your side. "It sounds like the commenter Sara is saying the regional culture of Cascadia shouldn't be approached with the "when in Rome" attitude that other regional cultures are afforded." Other cultures aren't actually "afforded" that unless it's literally a different country. And even then, speaking as someone who's traveled outside of the states, people in other countries don't expect tourists, transplants, visitors, etc, to "conform" to the local way of doing things. They expect you to be different and just accept you as you are, rather than unreasonably expecting you to act like a different person. I live in the Olympia area. If you drive 2 hours south to Portland it's like literally entering another world. As soon as you cross that bridge, people are friendly, they want to get to know you, they want to hang out, they give you their number, they invite you over to do things. And they don't care if you're an introvert, extrovert, or where you came from. If you're an introvert? Cool there's lots of bookstores and introvert indoor activities and things like that. If you're an extrovert? Great, there's lots of get togethers and people want to hang out, and stuff to do, etc, etc. Only in Washington State do people seem to think it's okay to expect every. single. person. To be an introvert. And to act like one. It's RUDE because reality doesn't actually work that way. People CANNOT actually stop being an extrovert if they naturally are. They simply cannot. If you look at like a Meyers Briggs personality type spectrum, like half the people on that spectrum are extroverts. I'm sorry but expecting people to pretend to be something they are not, and cannot be even if they wanted to, is in fact, genuinely unreasonable, and very rude. Extroverts have a right to exist, and co-exist with you, and you don't have a right to be hostile to them just because they are naturally extroverted and you are not. Being extroverted is not "aggression" and it's not "neurosis". You guys are like the dogs at the dog park where someone has never taken their dog out to the dog park, and so their dog is aggressive and snappy and doesn't play well with the other dogs. Meanwhile the other dogs are waging their tail and trying to play and be happy and that one dog just keeps growling and being snappy at all the other dogs having a good time. In animals we call that being under-socialized. It means the dog needs to go to the dog park more often. And once they do, the dog soon finds that actually, it's kind of fun. You don't have a right to be free from discomfort. Because if you did, it would apply to everyone, and everyone makes someone else feel uncomfortable in some way. Diversity is a big part of what makes life beautiful. Did you ever think that maybe the reason why you have such a high suicide rate out here, is because your attempts to make everyone conform and act the same, actually make even a lot of your local people miserable? It says something about your culture if so many of your own people are so unhappy that they kill themselves. Suicide rates are higher in WA State than the national average. That means people out here are DEPRESSED AND MISERABLE at higher rates than the national average. And you think you're the sane ones? Sane places don't have such high rates of misery and suicide. Do you know another place that has extremely high suicide rates? Japan. And they also have a culture with strong social pressures that encourage conformity, rather than embracing diversity. I'm not saying that your experience crossing the border is not valid, I find that folks in Portland (and Seattle for that matter) are open and friendly. But, linking social circles with suicide rates probably isn't all that valid. I've lived here for 8 years. I literally have no friends who are locals. In all that time. And it's not from lack of effort. Or even absurd levels of effort for that matter. I've allowed locals to treat me much worse than I would ever allow anyone to treat me anywhere else, simply to give them a pass, because I didn't want to risk offending their over-sensitivity if I dared point out that they were being inappropriate, blowing me off, or being rude. People out here just don't care about making new friends. They honestly don't seem to want to. They may have some very close friends they hang out with or they may not, but they don't want to associate with any new people. And that's just not normal. I've talked to people in Portland and they've said the same thing about coming up here when they came to Olympia. They found people here to be hostile and rude, and stand-offish and weird. They actually remarked about how weird people are up here. I'm just saying, it's not normal. And if so many people, (and there's tons of people who have said it) from all over the world, who have come here are saying this, maybe it's time people out here actually did a little self-reflection on why they hate other people so much, and like have such a difficult time opening up to people and making new friends? Rather than taking a rather narcissistic view that the entire planet is "wrong" and only Washington has it right, maybe actually stop and consider that there's something possibly wrong with people here. Ask, why do they hate genuinely opening up to people so much? Why do they hate genuinely being friendly? Why do they hate outsiders so much, even though people moving around to different states (for work, college, etc) is perfectly normal in every state? You know, in Colorado where I moved from 8 years ago, we have people who move there from California, or Texas too, and yeah we complain about them being bad drivers or whatever, but I mean it's not like we're rude to individual people just because they are from somewhere else. We still want to get to know each person as an individual and not just act like because they're from California, that they're going to be inconsiderate or whatever. And what is it with the hatred of Californians anyway? Californians are genuinely nice people. Everyone I've ever met from there has been really nice. I just graduated with my Bachelors degree the other day, and I had some local person glare at me for telling them I actually got a 3.9 GPA and was like happy for graduating. They were checking out my groceries and were like super pissy at me for graduating with a real degree in a real major from a respectable school. There's jerks everywhere, and jerks in all states, but I've never lived anywhere where being the jerk was the norm, and being nice and polite to people was considered rude. It's really strange out here. And being here for 8 years I think qualifies me to have solid opinion on that. It's not like I'm some visitor who's only been here a few months. It's genuinely not normal. I've actually met people who grew up here, then moved away, then came back. And they say it's weird here too. Those people who've actually like lived somewhere else, and then returned (for family or whatever), also share the same opinion. They agree, that it's not normal here and people are weird. They know what we're (the transplants) are talking about because they see it too. So it's not just people who have moved here who are saying this. It's also your own locals who have moved away and seen the world a bit and come back, who say the same thing too. Not for nothing, but I definitely fall into that category. I grew up here, then left for eight years and voluntarily came back. And my experience has been that I'd much rather live here than anywhere else. I'm not going to argue with your specific experience, but mine has been 180 degrees different. -I've never once been invited to anyone's house to like hang out. Ever. -I've never once been given a phone number by a local ever, for a non-professional reason like to just chat or text and be friends. -I've never been personally invited to an event or party ever, except for when the events were like public events. -I've made arrangements with people to like hang out or go do things or whatever, and the day of, when I was waiting at the bus stop or whatever to meet them or go do what we were going to do, they didn't show up at all and just totally flaked. -And this happened more than once. -Even our *neighbors*, whom we get along with, have flaked on us every time we tried to make dinner plans with them. -After discovering that no one would give me their number, I tried asking for their facebook, at which we began messaging sporadically on facebook and they'd suddenly stop responding in the middle of conversations and not reply again for a day or two, and often not apologize for it, and then, after having deeper conversations and like genuinely getting to know each other they'd stop talking as soon as I'd take a genuine interest in the things they liked. -Rinse, repeat all that for 8 years. -We got several people's numbers and contact info. -We got invited personally to multiple events. -We got invited to come over to people's houses, and hang out. -AND we actually did follow through with it, and actually did come over to their house and hang out, and they actually kept talking to us and not blowing us off afterwards and they actually wanted to hang out some more and be friends and keep talking. -We got invited to just meet up with people personally and that it'd be fun for them to "show us around Portland." -We got roommate invites if we ever wanted to move down there. ^^^Night and day contrast to how people are in Olympia/Seattle/Puget Sound area. THAT's normal. That's how cool people are pretty much everywhere. Except the Puget Sound area where they are strangely hostile and hate people. So put that in your pipe and smoke it, because that's really how it is. You also might be an introvert. I've noticed the only people who love it out here are introverts. And why wouldn't they? Everyone never wants to talk to anyone out here, they never want to meet up and do anything, and if they do, it's only after a long, drawn out, courtship of super-delicate mostly-electronic interaction. But imagine what it's like to be an extrovert out here. It's genuinely damaging to people who are extroverts. Like it's actually mentally unhealthy for people who are extroverts. And the problem is, most places actually have a good balance of culture. There are introverts, and there are extroverts, and they all have things that they do. But out here, being an extrovert is shunned. And since people can't actually stop being an extrovert if they are one, it becomes very damaging to their psyche if they don't actually have anyone to talk to. That's why so many people move away, both locals who grew up here, as well as people who have moved here for a bit. A lot of the locals say they're afraid to make friendships because so many people are only here for a bit and then leave, but in truth, it's their own behavior that drives other people out. Update: After almost 5 years in Seattle, we've sold our home and moved to SoCal. We've been here a month, and the people are truly different here (natives and non-natives). Maybe it's the sun? I made a lot of really great friends in Seattle. The majority of our friends were transplants to the PNW at some point or another. I appreciate all personalities and views on life + the non-judgmental tone of the PNW, it's a super progressive place to be! That's one of the reasons we moved away from the south. My advice for anyone trying to break through and make friends in Seattle is starting with meetup.com groups and similar community resources. Figure out what you're passionate about (if you haven't already) and go find your tribe. They are there, I promise. Really nasty area of the country. I've been out here over a decade and have lived in various parts of Washington over the years, and this attitude runs throughout. I've eventually come to the conclusion that it boils down to narcissism. Kids aren't raised with any concept of respecting other people who aren't in their immediate family. Don't be fooled by the liberal stereotypes of acceptance, it's almost entirely lip service to make people feel good about themselves, though being gay I'm sure is much easier here than in other places. In conclusion, I'm very sorry I ever moved out here and urge anyone who might be considering it to look around for a friendlier more polite culture. Having lived in different parts of the US, I can honestly say that regional culture comprises a set of unspoken rules that remain vestiges of the behaviors and customs of the original inhabitants of the area. I lived in the Pacific Northwest for 15 years, and can say that Scandinavian culture and social customs still influence that area to a large degree. Some call it the "Seattle Freeze", which is a bit reductive in my opinion. The kind of traits that are revered in Seattle: intelligence, rationality, calm, reservedness, introversion, innovation, progressive ideas, more gender equality, an extreme love of nature and the outdoors, extreme individualism, (and conversely, interest in social fairness), modest aesthetic living, and a lack of conspicuous consumption, practicality, the enforced division between the "public" and "private" persona.....these are typical Scandinavian traits that can be found to varying degrees in Scandinavian countries even today. I currently live in the US South, and find the behaviorial style to be firmly rootless in antebellum manners, vestiges which still can found even today: the over-the-top politeness (sometimes expressed as passive aggression: "Bless your heart! "), extroversion, anti-intellectualism, regressive ideas, (focus on the past, not the future), the focus on individual standing and reputation in the community, (punitively expressed by the group through gossip and "under the surface" maneuvering) a lack of freedom of speech, where there is much more self-censure and superficialities in conversation, more rigid gender roles and expectations, (although women are highly influential behind the scenes in the South), rural style culture and communication customs in the cities, although that is currently changing, uninterested in ideas of social fairness, although churches do contribute to these things, suspicious of outsiders, do not like to "stand out", slightly repressed with the tendency to act out, romantic, rational surface, irrational fantasy life. I so agree with your statement in how Seattle and it's surrounding areas like Tacoma, need to be genuinely nice, polite, respectful of all colors and people, and have manners. I wholeheartedly agree with your comment. Very succinct! ! Noone could have said it better!! Take note seattle know it all nuts! Maybe seattle people should travel to other places to take notes and heed. Your coldness exposes your shallowness!!! I think PNW are quiet to hind their inner prejudices and pretend to accept others but actually do not. And, while many are fairing well financially, if they actually speak up, we will see that they actually give crumbs to the homeless, newcomers, and immigrants and disguise it well as benevolence and a welcoming spirit.Bull! You are squirling away your goodies and smiling like chestershire cats because you are fake luars. Yes. Newcomers see past your fscade and rudeness and see you for who you are. Pitiful, Skuldugerous, hypocrites!! I agree! Very fuuny response too!! !